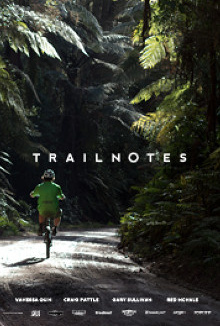 Trail Notes is a collection of stories capturing the lifestyles of passionate mountainbikers from the Southern Hemisphere Mecca of Rotorua New Zealand and the infamous trails of the Whakarewarewa forest. The film follows four unique individuals and showcases their stories of how mountainbiking captivated their lives and what has drawn them to the sport and the intoxicating location of the forest. Each of these interconnected stories creates a tapestry of the local scene that mimics the winding trails. These stories of personal battles, commitment and passion to the sport of mountainbiking, illustrate both the individual and collective culture that these trails breed.